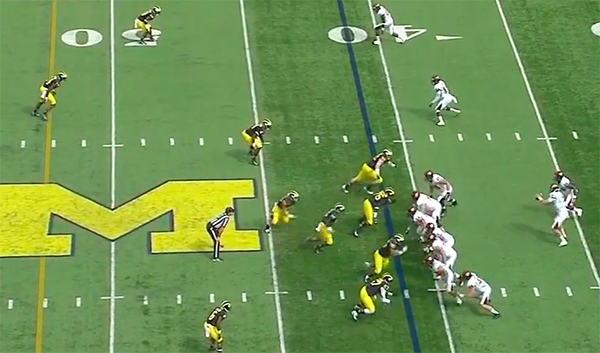 Central Michigan didn't have many opportunities to put points on the board, but one innovative playcall nearly cost Michigan seven points until Blake Countess read what was developing and made a leaping PBU. No caveats about competition apply here. Countess' field vision and instincts are on full display here and hint at a special year to come. It's early in the first quarter, and Michigan shows its base 4-3 under formation. 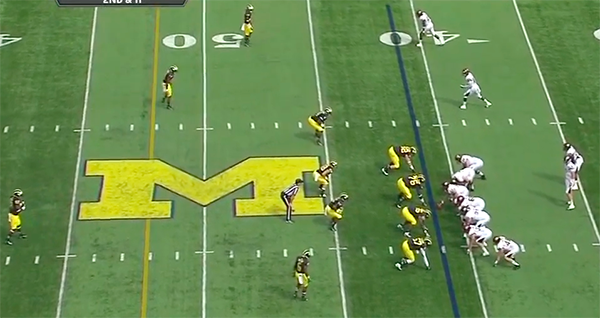 The pre-snap alignment shows that Michigan will play single-high safety, man coverage. Josh Furman (lined up on the hash at at the first down line) will cover Central's slot receiver, and Countess is split out wide on CMU's outside receiver. At the snap, Michigan's middle and weakside linebackers blitz. 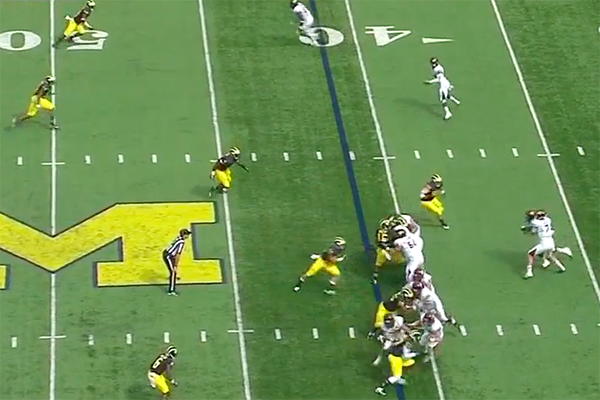 Central Michigan shows a zone read, leaving the weakside defensive end (Keith Heitzman) unblocked. Heitzman crashes on the handoff, but doesn't overcommit, about which more next. Furman and Countess begin to head downfield as the CMU slot receiver bows out for a flare screen. 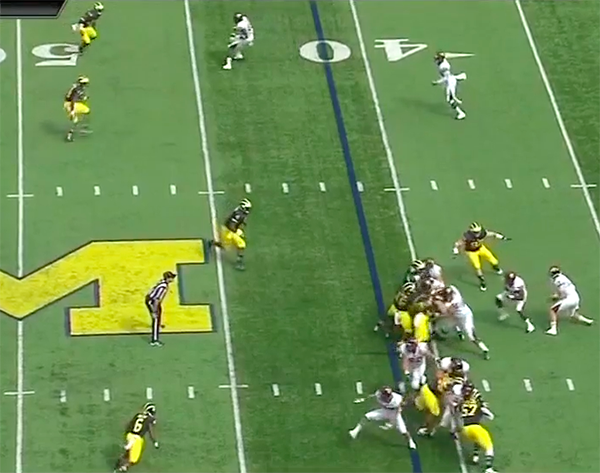 This is a triple option look that Michigan deployed often with Rich Rodriguez. 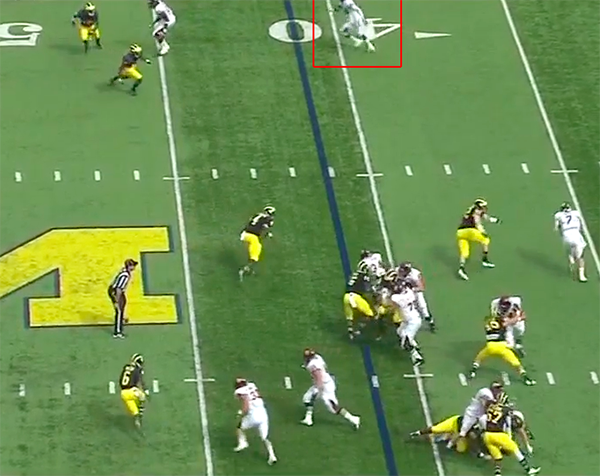 Often, after a mesh point in the backfield, Denard had the option to sling the ball outside to his slot receiver. 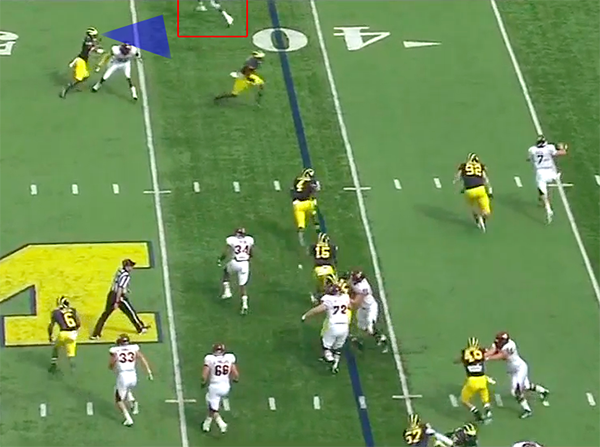 However, the Chippewas tweak the receiver route slightly. Heitzman realizes that CMU quarterback Alex Niznak pulled the ball on the read. He plants his foot and gives chase to string out the QB run. The ability to string out this play while also forcing the QB pull is not easy to do. This is a promising reaction from a player not expected to make a huge impact this season. At this point, Furman dismisses his coverage assignment (highlighted). Cam Gordon is scraping over the top of the play to attack the QB run, and even Countess is crashing from the corner to defend the run. What Furman doesn't realize is that CMU's slot receiver has turned the flare screen into a wheel route and is running upfield undefended (legs highlighted). 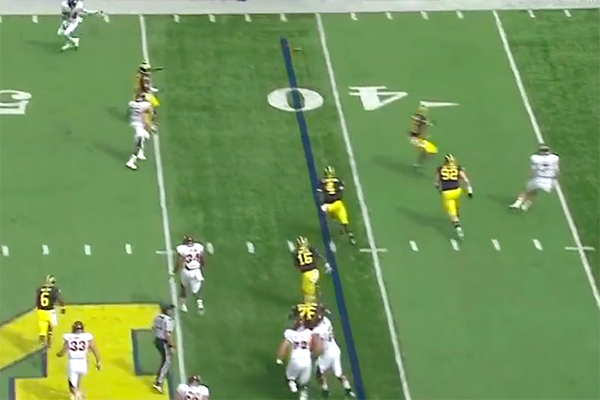 Countess, being picked by the outside receiver, recognizes that Niznak is pulling up to throw. As Niznak releases the ball, Countess has actually broken on the pass, recognizing the open defender. On first look, I thought Niznak threw a duck, but if you watch closely, you can see Countess actually tip the ball. The ball falls harmlessly to the turf. Huzzah. 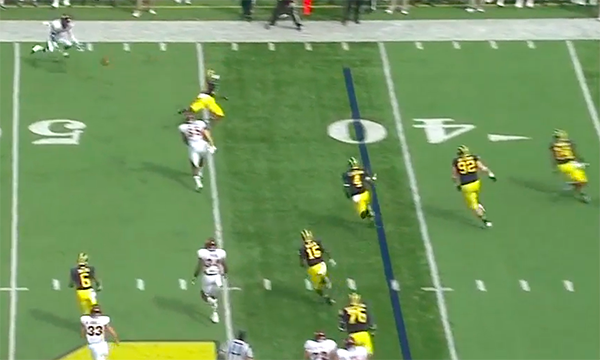 First, it should be noted that two of CMU's linemen were five yards downfield before the pass was thrown. If it was completed, a flag should have been thrown for illegal man downfield. But the real takeaway is Countess' play recognition and reaction. Not only did he realize that there was a triple option in play here, but he recovered for Furman who had blown his coverage. I was disappointed with the secondary in zone coverage, but don't remember Countess being the culprit on (m)any of those plays. I've been high on Countess since he came to Michigan, and his junior season debut held nothing but upside. With unproven safeties, having elite cornerbacks will be crucial to relieving pressure and diminishing big plays. Next week, Countess will see more action, which will give us a better indication with how he'll fare this season. But this was a promising start. Watching it on TV, my initial reaction to that play was that Heitzman looked slow. But he did play it well, as you point out. Perasaan memang diciptakan dengan cara kerja yang unik.